I have a complicated relationship with handmade gifts. Personally, I love them. I love making them, I love receiving them. If someone takes the time and effort (and cost! Why do non-artsy people assume that yarn and other supplies are cheap? Ugh. I warned you this relationship was complicated...) I feel lucky to get a gift with such a personal connection. My family didn't have a lot of money when my sister and I were little, so my mom made a lot of our family's Christmas presents. I thought that everyone's mom made presents for the whole family. Hats for everyone! Scarves! The year of the broomstick lace sweater was a little rough, but only because my awkward 11-year-old body managed to snag it on EVERYTHING!!! I never thought it was weird that my doll didn't look just exactly the same as my friends' dolls, and it was extra cool because I knew that my mom had made it just for me... That, and my dad, who did not much care for the style of Cabbage Patch Dolls had painted beautiful, super realistic eyes on my sister and my dolls, to match our own eye colors. It was pretty awesome. Instead, I'm proposing an alternative. How about a hierarchy of handmade gifts? I've got a project today that is awesome dazzling super-cool Middle-Tier-easy. You get all the "I can't believe you made this!" good feelings, with none of the "I don't have enough time to finish this!" stress. 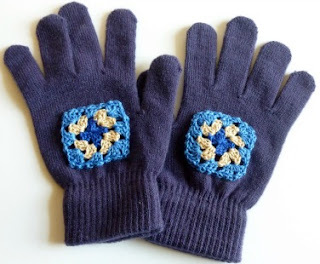 I love the idea of making gloves. Crocheting, by hand, a warm pair of hand-covers, there's something poetic and romantic about that idea. It also sounds like a crap-ton of work (but, I would SO appreciate it if I got some as a gift... Not a hint, but I'm just sayin' that that, my friends, is a gift of love. Top Tier all the way!) But I was at Target the other day, and they had the cheapy stretchy gloves so flippin' cheap that I couldn't leave the store without them. They were, like, two pair for a dollar-fifty. You can't beat that price! Of course, they look like cheapy stretchy gloves... But I can fix that. If you are part of the (over 1300!) Super Amazing Dynamos who have a copy of my latest book, Crochet Dynamite: Fun and Games (available at Amazon.com in the Kindle Store. You don't need a Kindle, they have FREE software for your computer/iPad/smart phone/techie awesome devices. Plus, if you're an Amazon Prime Memeber, you can borrow it for FREE!! Ahem, back to the post...) you've read about my latest love, Craft Cord. It's like embroidery floss that doesn't come apart. It's about the same size as the Size 3 crochet thread that I adore, but it comes in bright, multi-packs of awesome colors that I just can't find in crochet thread. And it's cheap like embroidery floss! So I grabbed up a few 10-yard skeins of my Craft Cord (sometimes called Craft Thread, it's marketed to the Tween friendship-bracelet-making community) and made some granny squares! I stitched them on and voila! the gloves look fancy and sort-of-handmade, but in a good way, like probably everyone will think you bought them at a 'real' store (whatever that means! Coal, I tell you, they all get COAL!!!). R2: 2 sl st across the next 2 dc to get to the next corner, ch 3 in corner loop (counts as the first dc), (2 dc, ch 2, 3 dc) in the same corner, [ch 2, (3 dc, 2 ch, 3 dc in the next corner)] 3 times, ch 2, sl st to 3rd starting ch to finish round. R3: 2 sl st across the next 2 dc to get to the next ch space, ch 3 in ch space (counts as the first dc), 2 dc, ch 2, (3 dc, ch 2, 3 dc) in the next corner, [ch 2, 3 dc in next ch space, ch 2, (3 dc, 2 ch, 3 dc in the next corner)] 3 times, ch 2, sl st to 3rd starting ch to finish round. Center the finished square on the back of the glove (make sure that you have them facing correctly to make a right AND a left glove, don't just grab them willy-nilly or you'll end up with two lefties... Ahem, not that I did that...) and pin it in place. You can try it on at this point (CAREFULLY so you don't get stuck) and see if you like the placement, if you'd like. My design aesthetic likes the square set back a little more towards the wrist cuff, but you're welcome to place it anywhere you like. Now grab your needle and outer color cord/thread and stitch it down. I stitched it using the back loops of the final round, but if you've got a way you like sewing embellishments on, go for it. Then do the other one and you're done! Easy-peasy, right? And your Middle-Tier friends won't know the difference! LOL!!! Yet another awesome project! I love gifting with coal for those who don't appreciate handmade! I almost spit out my coffee! But I totally agree! LOL. 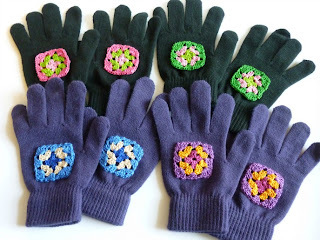 A couple of years ago, I bought those cheap stretchy gloves at a dollar store and crocheted with fun fur or other obnoxious yarns around just the wrists, then made matching hats and scarves for all the kids in the family. The hats and scarves worked up fast but I knew I couldn't knit or crochet gloves quickly so it all worked out perfectly. But I like your idea with the square here on the back - it almost gives the gloves a stained glass look about them and it's true - you do get all the handmade satisfaction without killing yourself with deadlines! Love it! Ah! Eyelash cuffs! I would totally do that too! Bow to the great Jaime! You nailed it. I hate to say but I got so mad at quite a few people this year they won't be getting any gifts. I can't believe that some people would rather buy a cheap, crappy version of what ever you make just because it was in a chain store (and end up spending way more than buying it from you too). When will people learn? 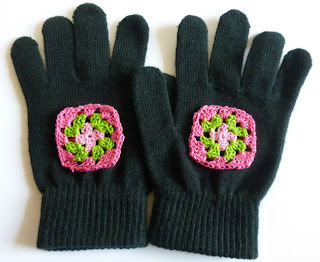 Love the gloves, it is just the right amount of handmade for the non crafty. PS: Sounds like we grew up very similar, I remember sneaking peaks at late on Christmas Eve of my mom finishing up the doll/bear she was making for me for that year. I'm right there with you. I think that some people (I'm thinking of a specific person, but I feel safe expanding the statement to a generalization) only truly feel loved when the price tag on a gift is larger than they expected. How funny! I remember watching my mom finish up presents for other people, only to be delighted on Christmas that they had actually been for me! I am a terrible mom when it comes to stuff like that. I didn't even pretend this year that stuff wasn't for Mims. Her "Cutest-Sock-Monkey-In-The-World" is sitting on the table, holding another unwrapped present for her. She shows everyone when they come by. LOL!!! OH! I am going to try these, thanks..
Hi Renee!! Thanks!! Let me know how it goes!!! HAHAHA!!!!! You have TOTALLY hit a nerve! SOOO TRUE!! I love the idea of giving coal to the ungrateful! ha! (you could crochet bits of coal, haha!) This is super fantastic. Clever, clever lady! And the three-tier system is perfect! yeah. awesomeness. keep it up. crochet coal!!!!!!!!!! !hahahah I am soooo doing that. Luckily i have enough people who are more than happy to get handmade goodies so they balance out the craft-snobs. I grew up with lots of handmade gifts (the elves made them just for me! ), and I am blessed (as I'm a single mom) that my kids are thrilled to get something that I have made just for them. Last year I made my daughter her very own Gnomeo and Juliet dolls and they were her favorite present. Hi Bri! I think your daughter loved her dolls because they were awesome and she knew the love and time and thought that went into them! That's what I want to raise my daughter to be like! You're an awesome mom!!! well your not to shabby in the awesome mom department yourself!!!! It is hard to make the kids gifts though without them catching me or finding it in progress. i ended up having to finish the dolls at 4am Dec 23. Um, Bri, you're Super Awesome (yes, I'm licensed to give superhero titles)! The Gnomeo and Juliet are so cute!!! And I am in love with the baby shower wishing star jar you made! Psst! Everyone else!! Go check out Pandabug Creations on Facebook!! I must say that my hand made presents are only for those who, I know, will appreciate them. They are too much time and too much of myself to get forced insincere compliments. 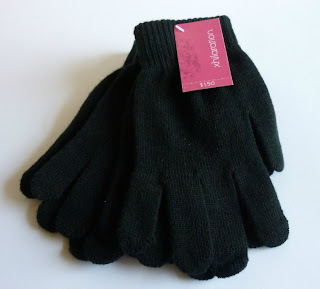 Having sait this I love the idea of the gloves and not only for those who deserves coal! I'm lucky my daughter loves my presents! Regardless of me overthinking this :) I love your pattern just the way it is and am anxious to get crocheting! Hi Lois! How funny that you should mention that, I have a friend who's been collecting hand warmers as part of her homeless outreach program, and I thought about a pocket for them while I was doing this. I think these squares are too small, really, to hold the warmers. But now I really want to do a larger pocket, like maybe a heart, to hold a warmer... Would it be better on the top of the hand, or in the palm of the hand. I don't have much experience with the warmers, so any insight you can share would be super appreciated!!! From my experience, a pocket on the palm of the glove/hand would be ideal. I work outside most of the day now, and generally that is where I put the hand warmer packet - inside my gloves on the palm side. Thank you so much, Lois! I've ordered some warmers so that I am sure that they'll fit the pocket! Hopefully I'll have a pattern together late next week! Those are great! Next on my list. I saw the 'craft cord' in the store and didn't know what the difference was between that and crochet thread (other than the colors were way more brilliant!). You are so creative!!! Thanks for the pattern and the wonderful story that accompanies it! Hi Nancy! It took me the longest time to want to even try it, because I hadn't heard of anyone else using it, and I wasn't sure how it was different from embroidery floss. Glad I finally braved up, because now it's my favorite new material to work with! A lump of coal. Hilarious! Hi sisterdonna! :D It makes me happy every time I think of it! Embroidery floss! 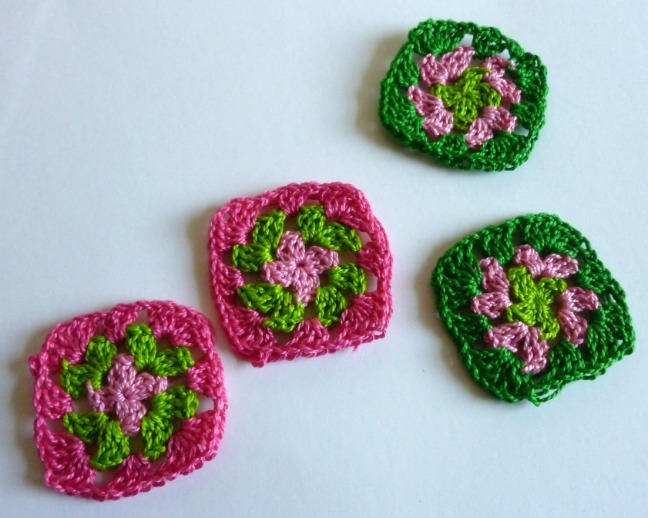 Or size 3 crochet thread! Walmart should have both of those! Hugs!! Yippee!!! I'm doin' the happy dance with ya!!!! I am so glad that it WORKED!!!! hmmm my square is bigger, I am not sure what this string is because I got it from freecycle. I think it looks gorgeous with the larger square! I love love love your colors!! Gorgeous!!! Ooh Renee! They turned out so cute! I love the snowflake, it looks so winter-y!